OLD SAYBROOK, Conn. - Nov. 17, 2015 - PRLog -- "Wreaths Across America", a traveling caravan escorted by the Patriot Guard Riders, will again return to Old Saybrook on Tuesday, December 8, 2015, with an estimated time of arrival at 11:30 a.m., followed by a noontime wreath-laying on Main Street at the Town Green War Memorial (next to Old Saybrook Fire Headquarters) attended by local veterans, townspeople, dignitaries and students. Old Saybrook is a major official stop in Connecticut as the Wreaths Across America caravan travels to Arlington National Cemetery, where the group will place wreaths on the graves of thousands of fallen soldiers. Old Saybrook has turned out in force to honor the traveling caravan in past years, so the Maine-based group will make the shoreline town a major stop again this year. A ceremony will be held at the Old Saybrook High School at 1111 Boston Post Road in Old Saybrook on Tuesday, December 8, at 1:30 p.m. The public, especially veterans and their families, is invited and encouraged to attend and to say hello to the Worcester family, who began the Wreaths Across America initiative, and to thank the 100-plus volunteer tractor-trailer drivers, Patriot Guard Riders, Maine State Police, dignitaries and veterans. Gil Simmons, a U.S. Marine veteran and NEWS8 Chief Meteorologist, will serve as the Special Master of Ceremonies for the event. Admission is free and the event is open to the public. Those invited to attend this year as part of Old Saybrook's special tribute are Governor Dannell Malloy, Lieutenant Governor Nancy Wyman and Old Saybrook First Selectman Carl Fortuna, CT State Senator Art Linares, CT State Representative Devin Carney, along with other state and local dignitaries. Morrill Worcester, the owner of Worcester Wreaths in Maine, began his generous initiative in 1992 with a trailer full of New England-grown wreaths decorated by volunteers, which he laid at the graves of fallen soldiers at Arlington National Cemetery. 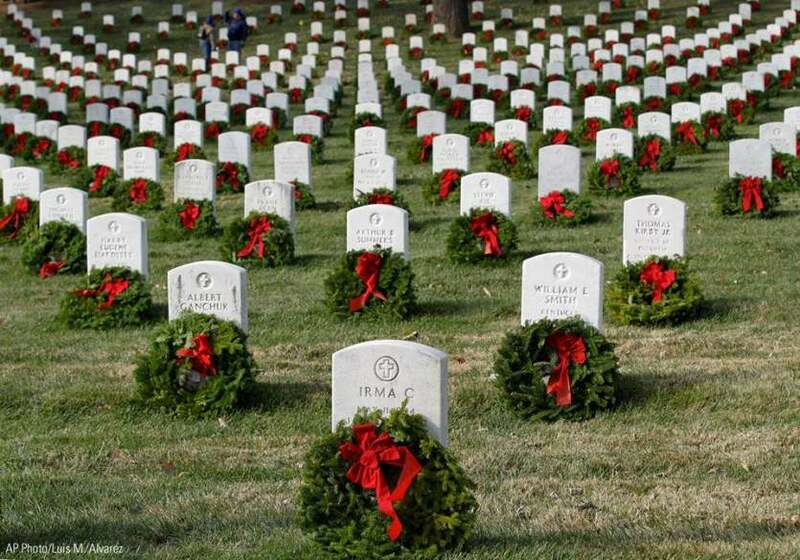 Over the years, the "Wreaths" mission has grown to encompass its current theme of "Remember, Honor, and Teach" the value of freedom in today's world. "We're honored to be able to pay tribute again this year to Wreaths Across America and its message of honoring our veterans," says Max Sabrin, one of the event coordinators and a member of the all-volunteer Old Saybrook Fire Department. "Several years ago, we hosted them in town, and they were all touched by the generosity and genuine goodwill that Old Saybrook showed them. So they wanted to stop here again, and everyone in town has pulled together to make Tuesday, December 8th, a very special time for Morrill and Karen Worcester and their Wreaths Across America volunteers, and for those of us in Old Saybrook." Sabrin also expressed special thanks to the Rotary Club of Old Saybrook; the VFW of Old Saybrook; the Elks of Westbrook; the Old Saybrook Fire Department; and the Kiwanis Club of Old Saybrook/Lyme/Old Lyme for their generous donations to make lunch possible for Wreaths Across America. The Old Saybrook Fire Department is also accepting donations to help defray the costs of Wreaths Across America Day. Please make checks payable to OSFD/WAA Day. The Wreaths Across America caravan is scheduled to depart from Old Saybrook High School at approximately 3 p.m., and the public is encouraged to cheer them on as they head out on their journey to Arlington National Cemetery.